We are pleased to announce that 14 new Talking Dictionaries for Latin America are now under development and are available for online viewing and listening. 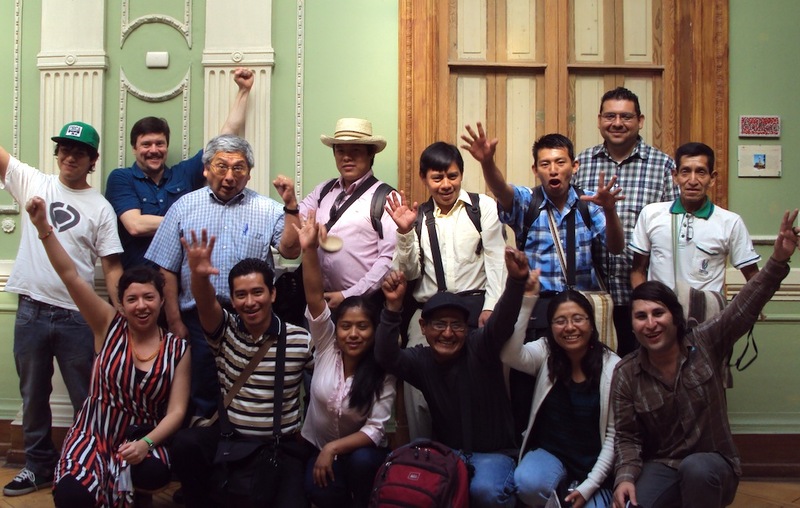 The new dictionaries were created in collaboration with indigenous speakers, linguists and technical specialists at two recent digital skills workshops in South America. Many thanks to Eddie Avila from Rising Voices who helped us facilitate the workshop, and to Cristian Maturana and the rest of the staff at Biblioteca de Santiago who helped us make the “Voces Duraderas” workshop a success for all who took part. The Talking Dictionaries for Nasa Yuwe, Sáliba, Embera, Uitoto and Wayuunaiki were produced by a team of linguists, indigenous specialists and language activists at a workshop at the Instituto Caro y Cuervo in Colombia. Dr. K. David Harrison traveled there in October 2012 to help facilitate the workshop and produce these dictionaries, which are still under construction. Check out our blog posting about his trip. These online dictionaries are a powerful educational tools for communities that are trying to revitalize their endangered languages. Each site is programmed to be bilingual so that speakers of the local dominant language can easily use it. It serves as a resource to help fluent speakers teach their native language to a new generation of speakers. These Talking Dictionaries were created by the Enduring Voices Project funded by the National Geographic Society and Living Tongues Institute for Endangered Languages. Additional support and hosting by Swarthmore College. Interface and database design under the direction of Jeremy Fahringer. If you love Talking Dictionaries as much as we do, please consider donating to our fundraising campaign to build 12 new Talking Dictionaries in Papua New Guinea. This entry was posted in Digital Resources, Endangered Language Activism, Enduring Voices Project, Gregory D. S. Anderson, Indigenous Language Activists, K. David Harrison, Language Hotspots, Launches and Public Events, Media and Publicity, Support Endangered Languages, Talking Dictionaries, Workshops and tagged Amazonía, américa latina, Amuesha, Andres Ozuna Ortiz, Anna Luisa Daigneault, Anselmo Nuyado Ancapichun, ayacucho, biblioteca de santiago, Bolivia, Carlos Enrique Cortez, chamacoco, Chile Espíritu Bautista, chiquitano, digital preservation, Dr. Gregory D. S. Anderson, El Salvador, Elmo Bautista, Emiliano Cruz Santiago, endangered language, endangered languages, enduring voices, Guatemala, Ignacio Tomicha Chuve, indígena, instituto caro y cuervo, Jonattan Laoiza Ancapichun, José Reginaldo Pérez Vail, Judith Condori Gavilán, language, language revitalization, latin america, lenguas en peligro, linguistics, mam, mapuche, mapudungun, María Inés Huenuñir Antihuala, maya, mazahua, México, mihuatec, monkox besiro, nahuat, online dictionary, Paraguay, Peru, pipil, quechua, quechua chanka, research, San Bartolomé Loxicha, Santiago de Chile, science, talking dictionary, tech, Tsesungun, Verónica Fidencio Núñez, voces duraderas, Yanesha, yshyr, zapotec, zapoteco miahuateco by livingtongues. Bookmark the permalink.